I think I need to reconsider my joy of eating them very often. I belong to a photographer’s group at flickr.com called Macro Mondays. Each Monday we have a suggested theme to follow to help pique our interest in macro photography. I’ve been a member of this group since March 2008 and have posted an image or two almost every week since then. On Tuesday, they post the suggested theme and we have the rest of the week to come up with something. Six months ago, they posted a weekly a theme called “diptych.” A diptych is a single photo created from two images. As I was shopping at my local grocery store, I came across some colorful donuts and the idea hit me. 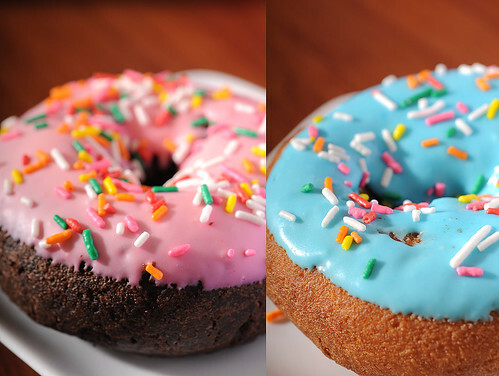 I chose a pair of pink and blue frosted donuts and bagged them up and brought them home to take a few photos to compile my diptych. I like taking photos of food and was planning to eat this food after I took the photos but I wasn’t hungry at the time so I put them back in their plastic bag for another day. Well, after one or two days, I thought differently and decided to set them aside for a future photo. I like taking ‘before and after’ photos for comparison and decided to save these for a while to see if they get moldy or go bad. Six months have passed since then and I took the donuts out of the dark corner of the shelf where they have set and I took a peek in the bag for mold or rotting and they were only slightly discolored from the sugar sprnkles merging with the frosting. They weren’t as hard as hockey pucks and no, I didn’t taste them but I did re-plate them and shot new photos for an updated diptych six months later. I’m guessing the sugar and oil that they were fried in helped to preserve them like McDonald’s french fries that you might find under your car seat that have been there for months. These two donuts are six months old with no signs of mold. Not much difference is there? It kind of changed my desire for eating donuts on a regular basis and I am debating on putting them back on the shelf for another six months for a follow up photograph. I promise I won’t try it with beef or chicken. That would just be sick and twisted. A bit of time has passed and I was overweight for a long time in my mid-life years. The years go by. Some are with regret, some are with joy but all are for learning. I’ll be the first to admit that I did not see myself as overweight and hurting my body until I checked in to the hospital for chest pains in October 2010. A year ago in June, I changed my life very simply and lost a lot of weight. For a long time, I cleaned my kids plates or my wife’s plate after dinner and ate a lot of fast food of various sorts at work. Later in life I began drinking too much alcohol and still eating a lot of food. I peaked out at 230 lbs a couple of years ago. When I was a young man of 22 and was first married, I was about 160lbs. Now my friends call me skinny, I hear “Looking good Dan,” etc. And I’m asked how did I do it? I’ll tell you for free. It would be really cool if I made $29.99 in three monthly payments for this advice but I don’t think I can market this one. Our stomach is the size of our fist. Or it’s supposed to be. I finally listened to my doctor’s advice. It only took 20 years to get from my ear to my brain. He held up his closed hand and said, “Your stomach is this big. Why put more in it than this in a sitting?” So, one year ago I began eating less and drinking much less alcohol. It wasn’t that difficult. I drank more water, ate apples (which are as big as our hand by the way,) a bowl or plate of food and sensed when I was full and stopped eating. I enjoy ALL kinds of food. I enjoy real butter, real cream, a slice or two of pizza, I don’t drink high fructose corn syrup in soda pop and I try to avoid its presence in everything that I eat. I don’t use Aspartame or fake sugar or fake butter. I enjoy real sugar, real meat, real vegetables, even Peanut M&M’s are an okay snack for me. I believe our bodies need fat to burn so I give it some. No low fat anything or fake sugar. I don’t have a microwave for those convenience foods that are highly processed and just fill our gut with non-nutritional, irradiated junk or destroy our leftovers. I re-heat my food on my stovetop in a cast iron or stainless steel pan. I don’t drink a specially blended shake or eat five meals a day. “I eat to live, instead of living to eat.” I saw and heard Johnny Carson say that 30 years ago. It took a while to apply that advice, but thanks Johnny. At my maximum overweight, obese size, I was up to a size 38 waist and wore extra large shirts and still couldn’t button up my collar to wear a tie. For a while, about five years ago, I was riding my bike for hundreds of miles a year and running up to 5k a day and dropped my weight down to 172 lbs before I injured myself from running so much. I was eating to replace those burned calories and enjoying beer, wine, and hard liquor along the way. When I injured my hip socket, I stopped that strenuous activity and put the weight all back on because I didn’t reduce my caloric intake. I am keeping my overweight photos visible to remind me that I was there and I’m not going back. I did not see myself as fat then. Maybe my eyesight is bad after all but now that I am back in a size 30 waist, medium shirts, and smaller shoes. I am happy though nearsighted. How much exercise have I done since I’ve lost weight? Practically none. I walk when I can. I haven’t pumped up my bike tires yet this year and I can no longer afford a membership to the YMCA so I can’t go there. Simple sandwich toasted in cast iron cookware. ViSalus shakes or other diets? None. What would I do when I reached my goal with those shakes or other diet? I did try South Beach, Zone, and other diets over the years when I couldn’t button up my pants or shirt but none of that worked or stayed effective. It’s much easier to just stop eating and drinking so much. I eat when I’m hungry, sense when I am full and stop eating. I get up and do the dishes, refrigerate the leftovers for another meal tomorrow. Yes, food is amazing, I love it, I love cooking and taking photos of the food that I cook. I know that we need to eat something every day if we are a normal human. So I enjoy it. In moderation. Share when I can or refrigerate the leftovers. I hope that for the rest of my life, I continue this way and if you or someone you love feels the urge to get back to your ideal weight, try moderation. It’s free. Save the money that you would be spending on food and drink and start shopping for smaller clothes because you are going to need them. By October 2011, I had given away all of my larger sized clothes to my son at MSU to use and give away to others there. Okay, this was for illustration purposes and I never wore a size 42 shorts but I did get to the point numerous times where my pants would fall down so I did replace all of my clothes. -Dan. 52 years old, Weight: 210 to 230 lbs, I now average162 lbs. Waist size: 38 down to a 30, shirt size: 17.5 down to 15.5. Diet: Moderation. Value: Simple, cost effective.